I had significant noise issues with my K type setup, too. I upped the filter on the input from K type to IC and that cured most of it. The details in my oven thread somewhere, you can find it if you care. Keep up the good work :-) Is your code around anywhere? Or is this a non-free project? Sorry if I already asked these questions and got answers long since forgotten. just cherrypicked my way around other people's projects and factory reference designs myself. It's just that there's very little of it to show at the moment without any actual control code implemented. I'll slap it on github once it is actually useable as an oven instead of it's current state of heat controlled lamp dimmer. I'm using the reference design, with series ferrite beads on both thermocouple lines, a 10nF parallel capacitor and a fast TVS diode on both lines. I upped the capacitor with an additional 0.1uF but it changed nothing. Not a showstopper if I cant solve it in HW since the kalman output is fast and clean enough, but it does bother me a lot that I couldn't fix it. I was surprised by how touchy it was, too. Not what I expected, but when you look at the voltage levels involved it's not too surprising. If you have trouble tracking down the info in that thread I'll have a crack at it for you. I found some passages about your struggles with noisy thermocouple readings, but I cant find any schematics of your filter setup. and as you said the voltage levels involved are in the millivolt range as it is. have been trimmed incorrectly at the factory and are actually suited for J-type tc's whilst being marked as a K-type chip. 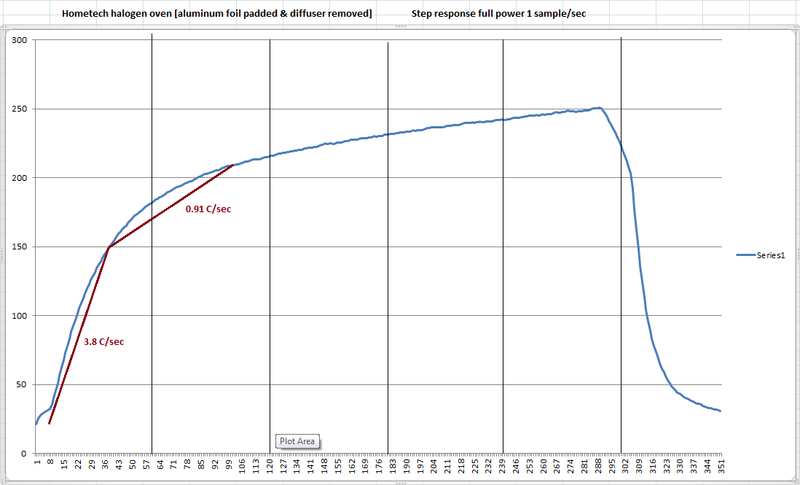 Today I performed a step response test to see what kind of ramp up rate the halogen oven can provide. Sorry to say I was woefully disappointed. 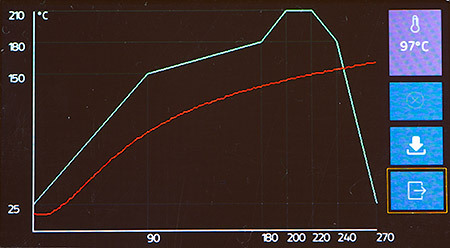 I routed my 'naked' thermocouple though the lid of the oven, set it to full power and started recording temperatures. 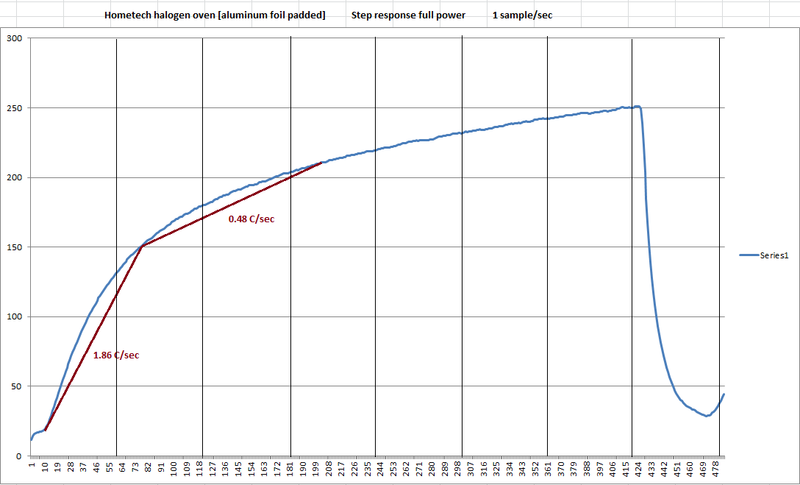 It starts off at around a healthy 2.2 deg C/sec ramp up rate, but it quickly transitions down to about 0.11 C/sec. 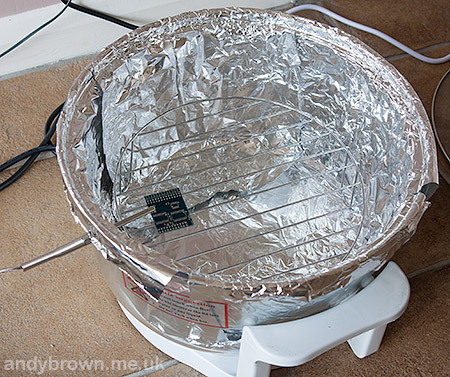 -Line the oven with aluminum foil (much cheaper than heat reflective tape and nearly as effective). The lid is left clear. 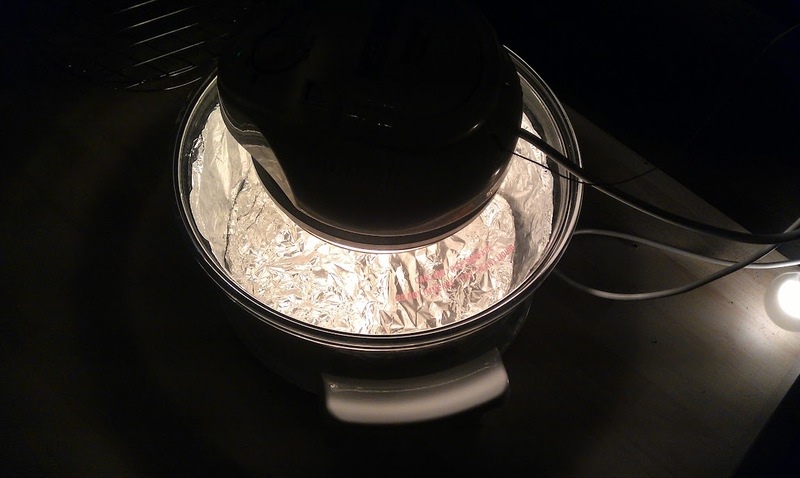 -Remove the light diffuser that's mounted beneath the heating element. -Plug the holes in the lid as much as possible (there's a big hole where the bimetal switch sits, which can be removed as I will be doing my own temperature control). The former 2 are things I've seen done in fellow flavorwave-turbo reflow ovens that potentially crank the ramp up rate above and beyond what's required. If hat fails I will be looking for a a stonger element or a different oven. How much power has it got? My litle rommelbacher didn't have much, and had a similarly slow response, It was a case of Full power, off at soak temp + a bit, wait till temp falls below soak min, or time expires, full again until peak temp, off, wait a few seconds to cool slowly then open door and cool rapidly. I got a decent temp vs time profile out of it. Unsure how much my total insulation session helped, but it certainly stopped nearby things catching fire outside the oven! 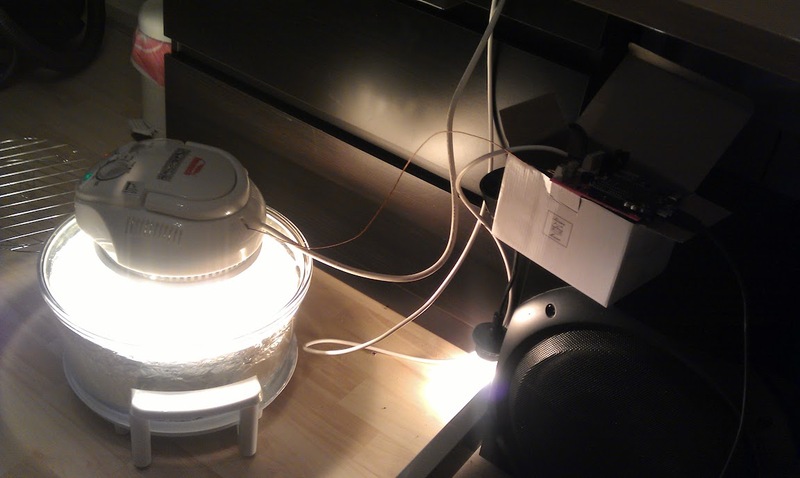 The oven is rated around 1300W, which should be enough for a small reflow oven. 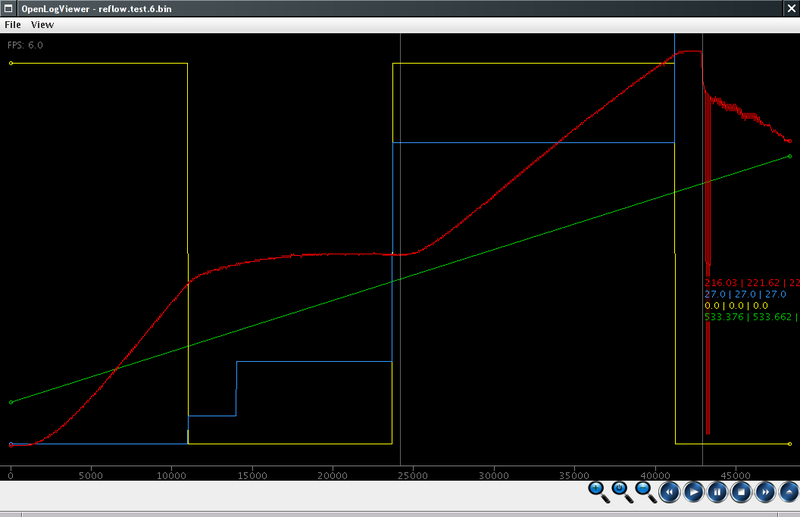 That's around a 1.4 C/sec ramp up to soak, followed by a slightly lower than ideal 1.2 C/sec ramp up to reflow. Still a huge improvement in the high end of 1.1 C/sec compared to my oven's performance. and I noticed the temps being processed to my csv file where still climbing long after I removed the lid. I did not even wait for the incoming temps to start dropping again as they were still rising a minute after the lid came off . So, on to some performance modifications. I'm guessing this will do the trick for eutectic reflow profiles. and covering it with foil. If the foil survives the heat I'm pretty sure this will scrape the last bit of performance from the oven. 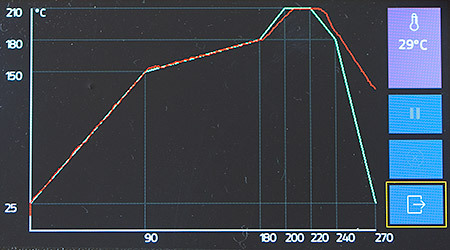 heated during a test is an unshielded thermocouple. What a strange and weird oven! :-o I thought you were working with something more traditional :-D Good work getting it up to speed.